It’s already Valentines Day, and as I pondered what to get my husband I wanted to consider some of the subtle nuances of our union…while still being playful and fun. We’re in our seventh year of marriage, and I’m not superstitious (ok, I’m not THAT superstitious) but best to be proactive. I was thinking a good idea might be to consider ideas that would scratch each others itch, so to speak… and heck, it would totally be a gift for the two of us if I did it right. I am a bit tardy posting this, so I can tell you I did in fact get him one of the items here–I won’t say which, that’s a bit intimate–but in case you’re in need of some last-minute ideas, a few of these are DIY friendly and pretty fast(ish). Sensual Games: Some of these games are more risqué than others, one even borders on the intellectual side, but regardless, they are all about getting more intimate and acquainted in a new way with your loved one. Romantic Scavenger Hunt: If you are crafty and adventurous, a romantic scavenger hunt could be very fun. Pick a spot (like a park), a sentimental location or even do this in your home if it’s really cold. You can make your clues sensual, sweet or downright dirty. You want to make sure the final clue is you–ideally in a compromising position. Need help? There are actually apps that do this for you. I found this one, but there are tons out there that are all about scavenger / treasure hunts. Also a game of sorts, these Love Haiku Cubes would be playful and thoughtful for any lover of words. And to add extra fun to your games pick up some accoutrements like the Kama Sutra Weekender Kit. Looking to make something together? 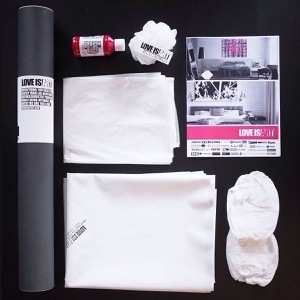 This Love Canvas is awesome (if not a bit messy). Not into paint clean-up? Then create a Love Time Capsule together. You could certainly make your own, or you can buy one that is ground-ready like this one, simply insert artifacts. I made this What I Love About You Mini Book for all my loves last year–my husband, my daughter and my son–and it was fun to write and I love when I see them flipping through it again.